Terdal (16.5°N 75.05°E.) is a bustling municipal town of 30,000 residents in Jamkhandi taluka of Karnataka’s Bagalkot district. Lying on the Jamkhandi- Miraj road on National Highway 53, it’s one of the many so-called towns—a hybrid made up of a village and a wannabe town—one comes travelling on the highway. There no malls or multiplex here. Yes, it does boast of a polytechnic and an Ayurveda college. If there is anything the town is famous for it’s the Terdal Shree Allamprabhu temple. Try googling “Terdal” and you’re likely to come across scores of entries related to banks IFSC code, Just Dial numbers and the name of the local MLA. The nearest big town is Jamkhandi, 18kms from Terdal while Sangli (Maharashtra) is 80kms away. Kitturs of Terdal, a family of farmers, are writing the bright story of farming. A media which feeds on sensationalism has totally ignored the success stories scripted by the farmers nationwide. The Kitturs are believed to be originally from Kittur in Belgaum—famous for Rani Chennamma of the State of Kittur (1778–1829) who fought the British East India Company, during which a British Commissioner, St John Thackeray was killed. Prabhu Kittur, Dhareppa’s (23) nephew, is the recipient of Krishi Yuva Samman Farmer of the Year 2015 (Youth) Award, an initiative of the Mahindra Group, for his innovative farming technique of growing tissue culture bananas, using organic methods and drip irrigation. Like most youth of his age Prabhu likes to watch Hindi movies but is not able to string together enough Hindi words to form a sentence unlike his father. “My nephew dropped out of school after seventh standard and has been doing farming since then. He was just six month old when my brother, Siddapa, died” says Dhareppa (46). A farmer who likes to experiment, Dhareppa who never completed his schooling sells what he calls “organic milk” at a price of Rs 40 a litre. He has installed a biogas plant which takes care of his cooking gas requirement. “I take lot of care of my 15 cows and 10 goats give them proper cattle field,” says he. After having read an article in a local newspaper about scientist Jagdish Chandra Bose’s experiment with plants Dhareppa has been playing music to his cattle and the crops since last ten years. “Between 10pm and 4am every day I play recorded instrumental classical music and have seen an increase in the yields by 10 per cent,” Dhareppa concludes. Most people are at their disgusting best and tend to say: Yuck; even those who swear by organic foods, when they come across an earthworm. When such incidents happen around me I generally mumble a prayer: God pardon them for they do not know. I know these ‘yuck’ people will never want to enter my farm, at least not during the rains: for you’re likely to come across the creepy crawlies at every step you take or see snails moving slowly on the branches. I am fond of my earthworms and they know that. My policy of peaceful coexistence has paid dividends: Earthworms here are nearly 8 inches long and almost thick as a lead pencil. Last year I had begun my search in mid October and realized it was too late. This time I started early and have been repeatedly egging Mangal, and thankfully we have had a good harvest of earthworms. 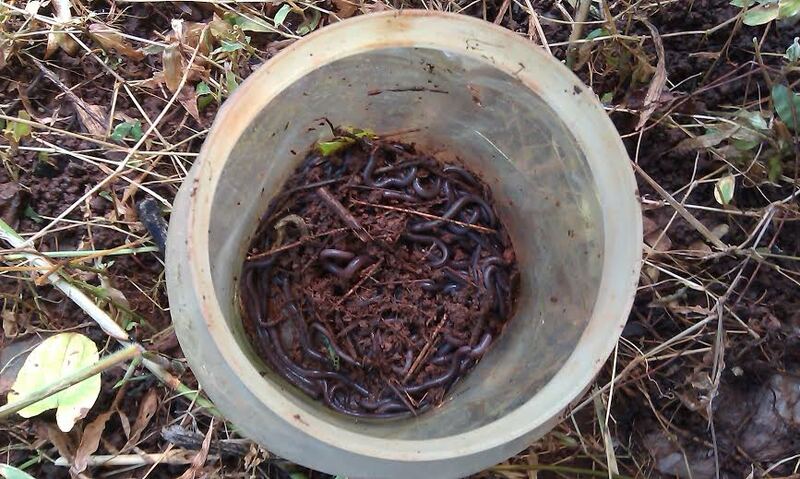 All these earthworms go to my vermicompost pit to live and multiply among the leaf and grass litter. Occasionally I feed the pit with the flour mill dust and egg peels. A farmer friend who sells vermicompost frequently sprays his pit with ghee and honey. “It helps,” he says. I was introduced to the beneficial affects of earthworm by none other than Dr Sudhir Ghatnekar of Biotechnology Resource Centre. A pioneer in management of waste and garbage using biotechnology, Dr Ghatnekar in November 2011 gifted me with buckets of earthworms. Mangal, my farm hand, had a surprise this Sunday for me. Let me go back before I reveal what it was. For over a year now I’ve been delivering used coconut shells to my farm; having carried them from home. Coconut shells in my home are not consigned to the dust bins to be taken to a landfill away from the city. Every Sunday as I leave home to take the 7.08am Badlapur local wifey makes it a point to put the coconut shells in a carry bag along with the other things I carry to my farm including my lunch. Over the months the pile of coconut shells has grown to attract notice of visitors. This Sunday I found the shells missing. Mangal has burnt them turning them into charcoal which I intend to use it as biochar. 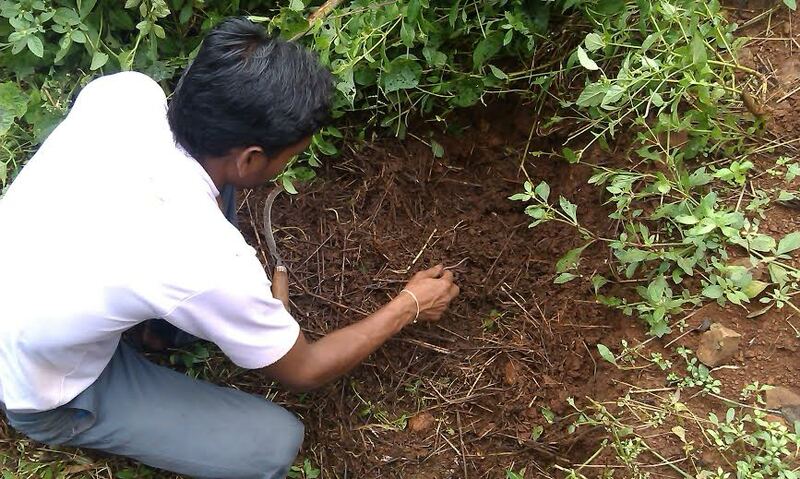 I have spread the biochar alongside my coconut palms and mango trees. Several days back I wrote a post about me carrying vegetable waste—peels, juice waste etc. to my farm spreading them around and letting them decompose. Since last week I added coconut shells to the list. Using one coconut a week at home for garnishing poha, upma and idli chatni we end up using around 10 coconut a month. Imagine using 10 shells multiplied by 12 which come to 120 a year. In fact, its 240 shells (as the coconut is broken into two pieces) going to the municipal dump! From now onwards it will be less 240 shells. That will be my contribution in recycling and conservation. I don’t litter them in my farm leaving them to the elements but process them to make biochar (or biocharcoal). It is essentially charcoal, but burnt at a lower temperature and with a more restricted flow of oxygen. Remember the black thing (charcoal) used by the neighbourhood istriwala to heat up the iron to iron the clothes. Nowadays, he uses electricity to power the iron. Biochar works in several ways. 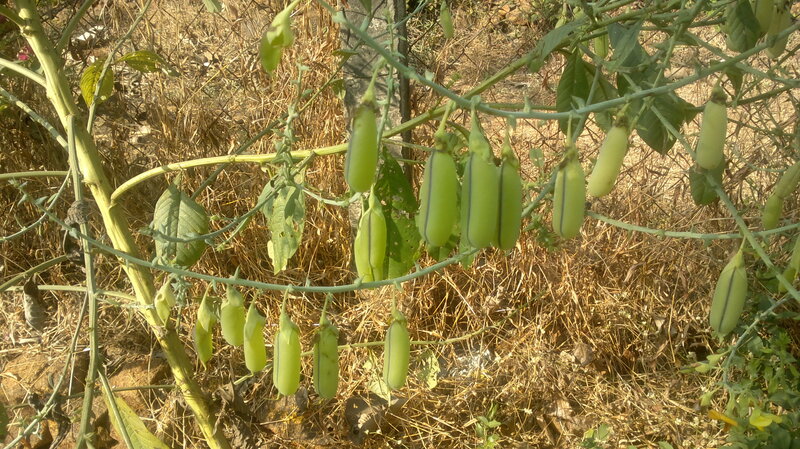 Though it is not filled with nutrients itself, it is able to attract and hold on to nutrients, so preventing them from leaching away, and holding them just where plants can reach them. Its porous nature provides refuges for mycorrhizal fungi, which in effect enlarge the plant’s root system while also increasing its resistance to diseases. It makes soil far more attractive and stable for beneficial microbial activity. Essentially it does everything organic matter does to the soil, but better, and permanently. Dr Saran Sohi, of the UK Biochar Research Centre, started his career researching soils and soil additives. He says the effect biochar has on soil is different from that of any other additive. “Biochar brings a physical and permanent change to the soil. Every other additive decomposes but biochar remains, and its effects increase over time,” he told The Telegraph. •	Dig a deep trench in a bed. Use a fork to loosen the soil in the bottom of the trench and you’ll get the added benefits of this “double-digging” technique. •	Pile brush into the trench and light it. Fire starts out hot, but is quickly slows down as oxygen supply is reduced. •	The best way to tell what’s going on in a biochar fire is to watch the smoke. The white smoke, produced early on, is mostly water vapour. As the smoke turns yellow, resins and sugars in the material are being burned. •	When the smoke thins and turns grayish blue, dampen down the fire by covering it with about an inch of soil to reduce the air supply, and leave it to smoulder. 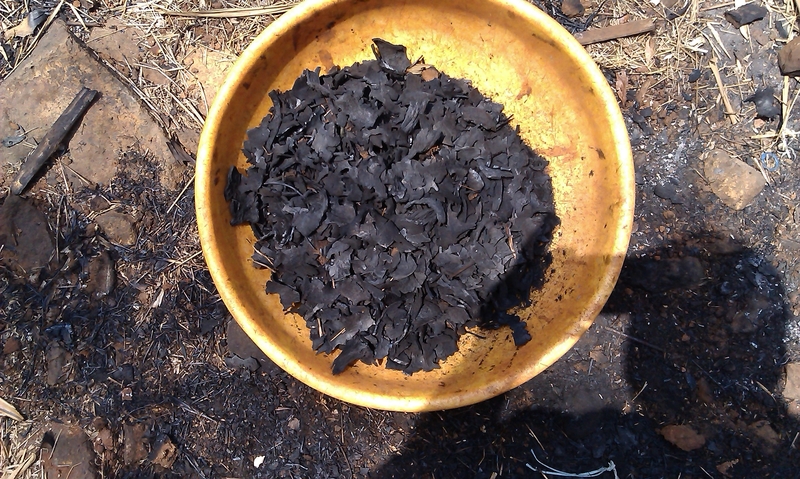 •	After the organic matter has smouldered into charcoal chunks, use water to put out the fire. Another option would be to make charcoal from wood scraps in metal barrels. Those visiting Mumbai during the nine-day long Navratri Utsav come across a phenomenon, which I would prefer to, call ‘colour shock’, in absence of anything better. For majority of working women who commute to their place of work are dressed in a particular shade. The colour coordination begins with the sixth day of the festival, with green. Then comes yellow, followed by red and blue. Be it the municipal offices, the State Government offices, the train platforms, the shopping malls, the schools and others places where women are seen or assemble are awash with colour. Most of them dressed in saris. 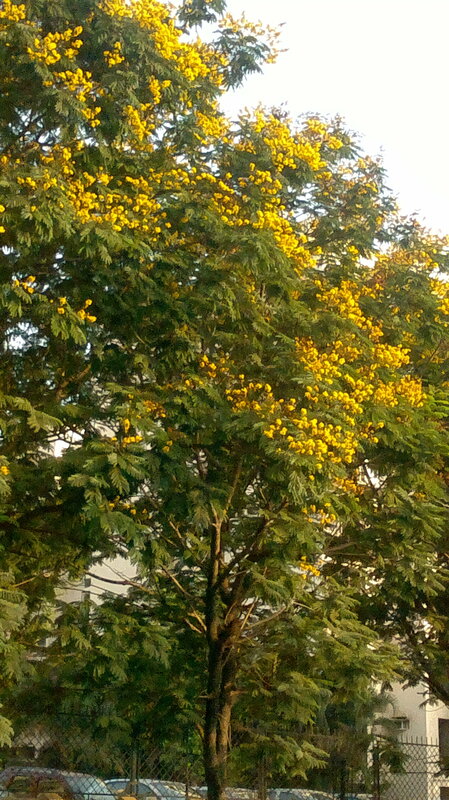 These are the days when the drabness of the city is blanketed by a colour palette. In a similar vein I think months to have their favourite colours. I would assign ‘pink’ to April. 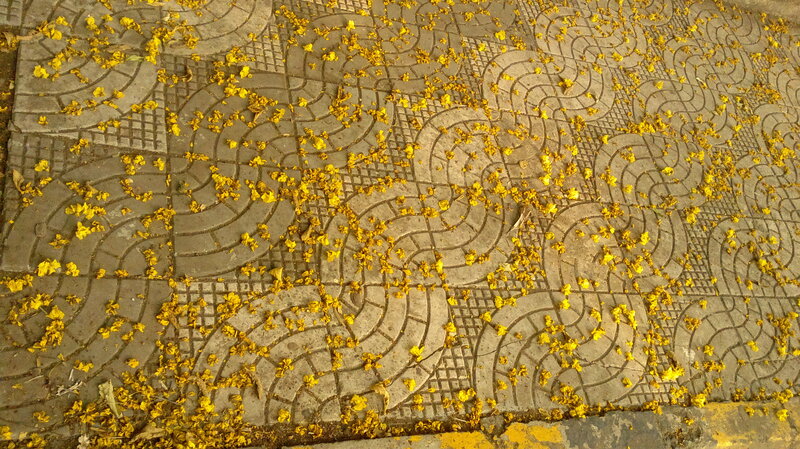 It’s the colour of flowers I have come across all over. 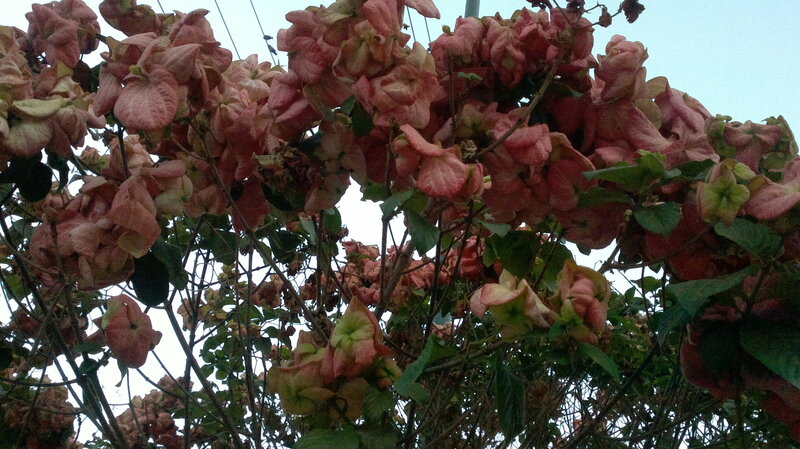 The hint of bloom begins in the last week of March and matures in the following month. 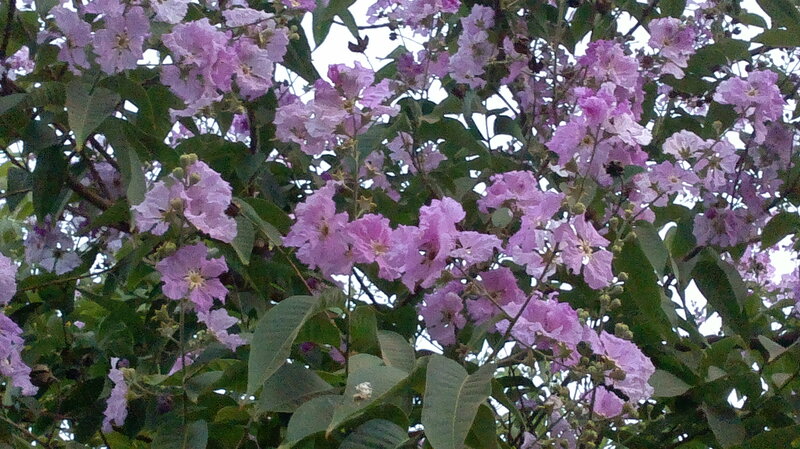 The colours are pink, mauve and lilac blooming everywhere. Roadsides, housing societies, parks and gardens and farms provided glimpse of this, provided you’re watching. The first one is the Queen’s Flower.Can someone there help me identify the other one featured in the post or suggest names of other ‘pink’ plants?